Our family's Brittany cottages France holiday experience was great. Brittany is famous for it’s beautiful countryside and small villages and people love to spend their holiday experiencing the rural life in Brittany. …Getting away from their hectic lives, picking up fresh produce in the open air markets, cooking at “home”, exploring villages and historic spots and feeling like a native. We planned our family holiday in August. My 88 yr old dad was coming from Florida, my cousin from New York, my 11 yr old niece from Paris and the rest of us from California. 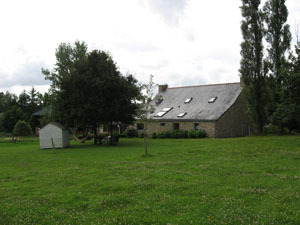 We wanted to find a holiday rental where my dad could be comfortable spending a day at home if he got tired of running around with us, where we could be close to the Golf du Morbihan where the beaches and water are warmer. And, a place big enough for all of us to not be on top of each other. 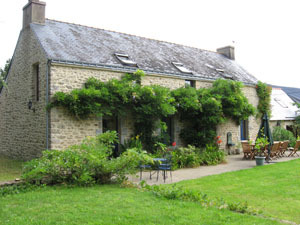 After a lot of searching for Brittany Cottages France we found a beautiful house. With so many of us to coordinate we started our search in February – late. A lot of properties for the prime weeks of August are taken by then. 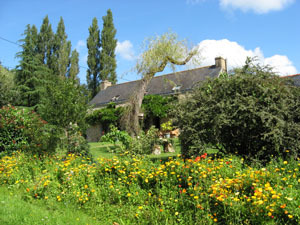 People tend to return to Brittany again and again and book their “favorite” place well ahead of time. Brittany is the number 2 go to vacation spot in all of France. Start your search in December if you’ll be going there in the summer. Our house appears to be no longer available to rent. The owners were teachers and took their campervan holidays while they let their house. They list the same properties. To reserve your selected property you must give them a deposit payable in Euros or sometimes if the owner is British, in Pounds. For us we arranged a wire transfer. And we negotiated sheets and towels for an extra fee. Other options could be Paypal, or a cashiers check in the appropriate currency. TripAdvisor is another on-line booking site for holiday rentals. You start by doing a search for Brittany France and then the properties are listed alphabetically by town. There are guest reviews of the property if there are any. But on this site I noticed what also came up were camping properties as well which I think don’t belong in the category. 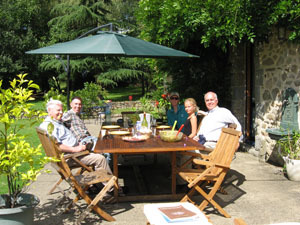 We ate well, saw all the sites had a great family time on our Brittany Cottages France holiday in the Morbihan. Remember to book early so you can stay where you want. We got very lucky to find this place for August on our February search.